The current Lawn Fawnatics challenge is an inspiration challenge with a color palette based on Lawn Fawn's Really Rainbow-Christmas papers. I used the colors on my dog themed winter holiday design. 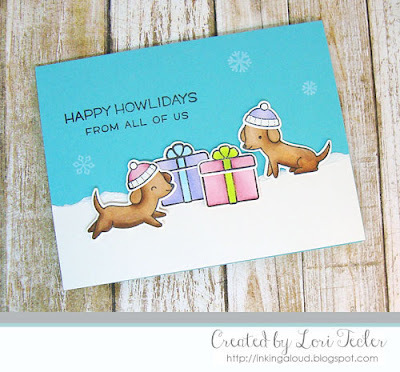 I stamped up a pair of critters and presents using the Happy Howlidays stamp set. After coloring the images with Copic markers, I used the matching dies to cut out the images, then played with the image placement a bit before settling on the arrangement you see here. I created a background by adhering a piece of torn shimmery white cardstock to the bottom of an aqua card base. The images were arranged on top using foam tape for dimension. For the sentiment, I paired the "happy howlidays" from the Happy Howlidays set with the "from all of us" from the Simply Winter Sentiments set. A trio of snowflakes stamped in white pigment ink above and around the images completed the design. What a fun and whimsical little winter scene you've created!